Loki’s Exile Coming to Steam! The headline is correct: We’re headed to Steam! Norse Noir: Loki’s Exile has recently made it through the Steam Greenlight process and we couldn’t be happier – This is a huge, huge boon for us and the title, and we wanted to show our appreciation to everyone who’s helped support our campaign over the last month with a special wallpaper! Our special Greenlight celebratory wallpaper! We are again sincerely grateful to all our fans and followers who have helped us reach this goal and we’re looking forward to having more to show from the team soon. Until then! Loki’s Exile Funded On Kickstarter & More! Hi everyone! We’re a bit late with the news here on our official blog, but in case you’ve missed it – We were successfully funded on Kickstarter! Not just funded but blowing past our expectations at over 130% of our original asking amount and even securing enough to make our first stretch goal and ensure the inclusion of a special ‘after credits’ epilogue scene for the game. We on the team are all completely blown away by the showing of support we’ve been given by all of you and are very excited to know that we now have the funds to make the best possible version of Loki’s Exile we can. From all of us to all of you – Thank you so, so much!! We couldn’t have done it without you, and it’s sincerely appreciated. Norse Noir: Loki’s Exile Now Available for Pre-Order Via Paypal! If you didn’t have the chance to get in on the Kickstarter, though, there’s still time to pre-order your copy of Norse Noir: Loki’s Exile via our brand new Paypal store! You can pre-order purchase the game, our soundtrack, and even still have the chance to see your name in the credits for our game! To check out our Paypal store and pre-order your copy of Loki’s Exile, click here. Loki’s Exile – Currently Voting on Greenlight & Good Old Games! 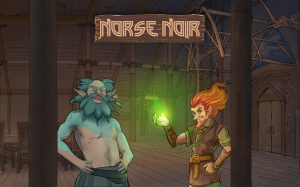 Norse Noir: Loki’s Exile Available for Voting on Steam Greenlight & Good Old Games! Loki’s Exile is currently available for voting on both Good Old Games and Steam Greenlight and we would love to have your support! To make sure Loki’s Exile will be available on both platforms, make sure to visit both our Steam Greenlight campaign page and our GOG page and vote yes for both! So what’s next? First off and foremost we have a game to make! There are lots of little detail things that need to happen from the Kickstarter (sending out our promised pixel demo to backers is first on the list, and should be happening before the end of the week) and we’re also starting to get knee-deep in the process of finding voice actors to help bring our game to life. We’ll also be migrating over some of the goodies we showed off in our Kickstarter updates to the blog here, along with a couple of new shinies, so make sure to keep watch for those. In the mean time, though… I’m going back to writing. ;) Thank you again to everyone for your amazing support so far – We’ll talk more soon. Cheers!